Are European Leaders Saving Their Social Model Or Destroying It? 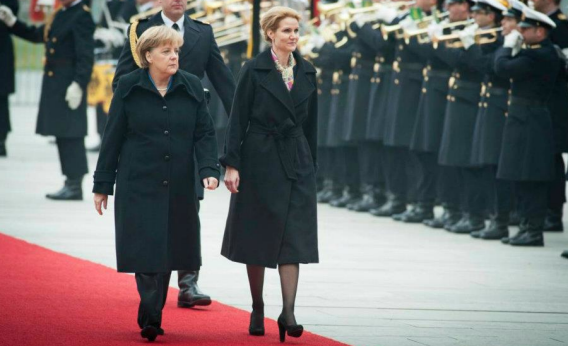 Danish Prime Minister Helle Thorning-Schmidt and German Chancellor Angela Merkel. A somewhat contrary view was expressed by European Central Bank President Mario Draghi in an interview yesterday with the Wall Street Journal in which he said the European social model is “already gone.” During the Q&A following Thorning-Schmidt’s speech her countryman Jacob Funk Kierkegaard of the Peterson Institute here in D.C. seemed to agree with Draghi, asking if the eurozone banking crisis isn’t a kind of blessing in disguise that’s finally forcing politicians to enact labor market reforms that would have been a good idea all along. Whether you agree with Kierkegaard about that or not, this once again highlights the central dilmma of the “independent” central bank. Kierkegaard is a writer and a policy analyst. He pushes for labor market reforms by trying to convince people that they’re a good idea. Thorning-Schmidt is a politician, she pushes for labor market reforms (or not) by campaigning and winning elections and securing votes in parliament. But Draghi is a central banker. His job is supposed to be to provide macroeconomic stability—low unemployment and non-accelerating inflation. But he’s got views on these matters every bit as much as Thorning-Schmidt or Kierkegaard or myself. But he actually has the power to make Kierkegaard’s version of the old saw about the Chinese characters for danger and opportunity into a reality. By tweaking the speed and alacrity with which he responds to short-term demand-side growth issues, he can mightily influence the course of long-term structural policymaking. Elected officials in Italy and Spain don’t have the tools to stabilize the Spanish and Italian macroeconomies over the short term. But they do have the tools to implement long-term structural reforms that Draghi either likes or dislikes, and Draghi has the power to dispense short-term stabilization in accordance with his estimation of the merit of Spanish and Italian long-term policies. In effect, he and his colleagues are running the whole show while simultaneously being accountable to almost nobody.